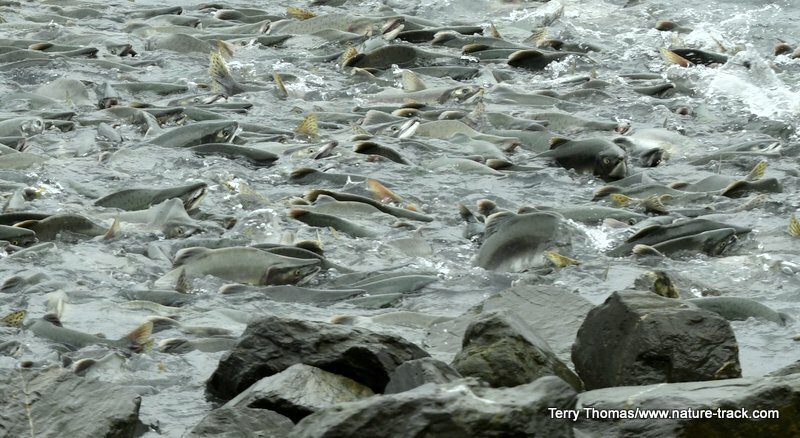 Pink Salmon fight to get into a tiny stream of runoff water from the Solomon Gulch hatchery in Valdez, AK. Expand this scene several thousand-fold and you have an idea of what it looked like at the hatchery weir. Sure enough, what we thought was rain agitating the surface was really the fins and backs of thousands of pink, or humpy, salmon. It was like a glimpse back into Idaho’s past when harvesting the plentiful salmon could be done with a pitchfork. We continued to gawk, amazed by the incredible sight, when a black bear ambled out into the melee, grabbed a fat fish and headed back to the trees to feast. In another mile, we were at the hatchery at the base of Solomon Falls. The hatchery had placed a barricade across the mouth of the stream, perhaps 25 yards wide, and pink salmon and a few coho or silver salmon were stacked fin to fin, backs protruding from the water. There were tens of thousands of fish at the weir trying to get over, failing and eventually diverting up the channel into the hatchery. For several hundred yards all around the mouth of the stream, salmon were packed in, following their instinct to return to their ancestral spawning ground. It was incredible and a scene that repeats itself day after day for weeks. In Idaho, we tend to only think about two kinds of ocean going salmon, king or chinook salmon and the red or sockeye salmon that clings so tenuously to continued existence in Idaho. Coho/silver salmon were declared extinct in Idaho in 1986. However, through efforts at the Nez Perce tribe hatchery, silvers have been successfully re-introduced and now provide a fishery on the lower Clearwater and Snake rivers. There is one more Pacific species that seldom gets the acclaim it deserves though. Chum salmon, also called dog salmon, really aren’t sought after by two-legged anglers but when humans do fish for them, it is usually with techniques other than rod and reel. Native Alaskans still depend upon dried chum salmon to feed their sled dogs throughout the winter. Alaskans tend to rate salmon by taste rather than by size and consider themselves salmon connoisseurs (some say salmon snobs). The king salmon, by far the largest of the five Alaskan species, is also considered the best eating by many Alaskans. Silver salmon, averaging 8-9 pounds but growing up to 20 pounds, are a close second. Sockeye salmon, a mid-sized salmon and the namesake of Idaho’s Redfish Lake in the Sawtooth Mountains, while still considered excellent table fare, ranks third for some, first for others. Not many Alaskans fish for pink salmon, the smallest of the ocean-run salmon, which they consider only so-so on the table. They are important in the canned salmon market, though. As stated before, chums, the second largest of the salmon, are rarely consumed by humans, especially Alaskans. These five Pacific Ocean species are a tremendous boon for the Alaskan economy. Besides the millions of pounds canned annually and fresh salmon shipped around the world, all of which helps support a huge commercial fishing industry, sportfishing is huge, drawing in thousands of anglers a year. 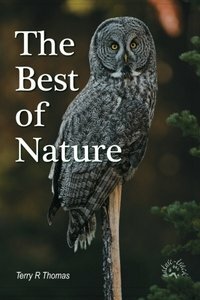 Salmon are also an important seasonal food source for many Alaskan bears, eagles, otters, sea lions, seals and scavengers like gulls at the top of the food chain all the way down to micro-organisms and likely play a keystone role in the ecology of the area. Seeing and catching Alaska salmon has been a highlight of our trip to Alaska so far. It has been awesome to see this incredible resource up close.